There is a 2016 Nissan Murano Hybrid. It uses the supercharged 2.5L I-4 engine that was in the 2014 Pathfinder Hybrid (yes, there was a 4-cyl hybrid Pathfinder). 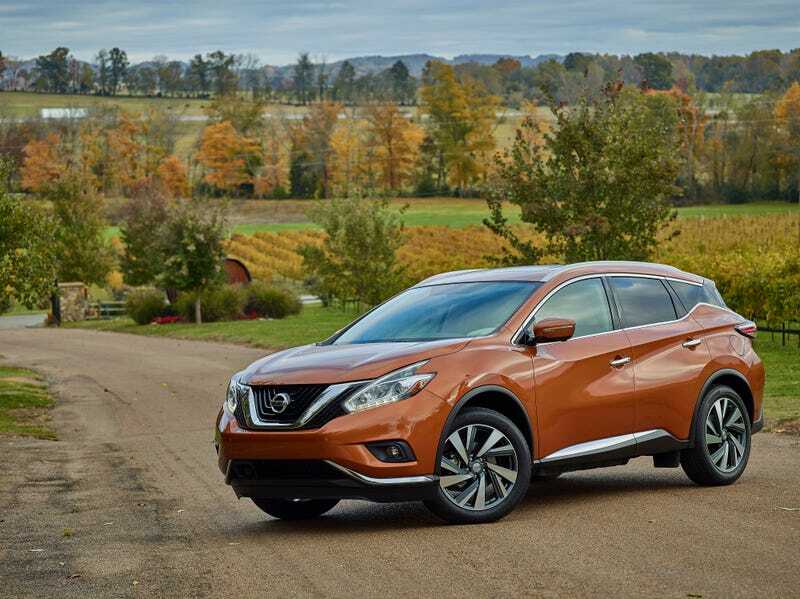 You’ll find the Murano Hybrid baked into the trims of the Murano configurator. The hybrid system is only a 10hp loss compared to the 260hp 3.5L V6 equipped models but adds about 170 lbs compared to the conventional powertrain versions. That said, you can bump your 21/28 mpg with the V6 up to 28/31 mpg (FWD), or 26/30 mpg (AWD). It’s also worth noting that the Nissan Murano has been a phenomenally reliable vehicle for the past 5 years, really one of the few remaining Nissans that holds up to the “Japanese reliability” trope. *Nissan has missed that trope, call it the Nissantrope, not to be confused with misanthrope which would be completely incorrect since all Nissans are built for the only race that matters, the Human Race. *That tangent was technically a secant which most would say Nissan currently recants until they remember what the Human Race is like in general. The Murano Hybrid is only offered in SL and Platinum trim levels ($40,130 and $42,180 respectively). This means they are a premium over the $39,180 Platinum trim for the conventional model, which shouldn’t be a suprise to anyone. That sticker shock does numb once you realize this variant is like a discount RX450h. Well, that is, until you find out Nissan doesn’t have any real intentions of selling these, they are just getting rid of last generation parts in order to make room for the new hybrid powertrain. But in the enthusiast world we refer to that as “building a unicorn.” Now understand your fuel economy won’t be as high as the RX450h (around 30 mpg average versus 28/29mpg in the Murano), however the Murano Hybrid is set for regular fuel instead of premium which means you’ll actually spend less over the year’s average since the fuel efficiency ratings are close enough for the pump price to be worth accounting for. For those upset over the loss of the Pathfinder Hybrid (which you learned the existence and cease-to-existence of today) or simply need a third row and a luxury badge, feel free to checkout a 2016 Infiniti QX60 Hybrid. It uses the same powertrain but is nearly a $12k premium over the Murano and averages 26 mpg comined for nearly the same price as the RX450h base sticker of $53,035. In that case, you’re better off with a Highlander Hybrid which is cheaper and gets 28 mpg combined. Pretty much, the Nissan Murano Hybrid is the only time a non-Toyota SUV is a great call. Wait a second...you mean to tell me there is a 2016 Subaru XV Crosstrek AWD that’s rated at 30/34 mpg? It’s under $30k?! Well hot damn!! Why is that exciting? I’ll give you a hint, name three different models of hybrids with hatchs that aren’t SUVs.